This year Littleton Sailing Club will be 60 years old and we are celebrating our anniversary in style over the weekend of 16th/17th June, both on and off the water. We are delighted to be welcoming the Mayor of Spelthorne and her Consort for lunch on Saturday and will be inviting her to start one of the races. We also hope some of our old time members and ex-members will come along to share this special occasion. We have a full programme over the weekend, racing for the coveted Burgee Trophy which was first raced for on our 50th anniversary. There will be 3 races on Saturday and 3 on Sunday with the best 5 out of 6 to count. Entry is open to all members. 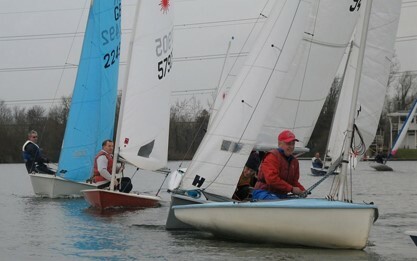 There will also be some on-water ‘fun’ sailing related team games for the junior sailors. This will start around 14:00 on Saturday. On Saturday evening the celebrations will continue, with a jazz band and a hog roast, and to end the evening a spectacular firework display. Information and tickets …..
Overnight camping is being allowed on Saturday night, then the final 3 races will take place on Sunday, followed by a prizegiving ceremony.